Belgium Guest Gets The K-Bay Tour and Catches His First Fish and Hey: I Found A New Fishing Spot! Most of the time, my trips are scheduled out ahead of time, but like this morning, sometimes they are spontaneous. Joost (sounds like Yost) is from Belgium – which is a country sandwiched between France and Germany. He is here in Alaska for his second trip, and appears to be liking it at Majestic View Bed and Breakfast. Yesterday, he went bear viewing over at Katmai. This morning, we were sitting around the breakfast table talking about the day before (his bear viewing trip and my tour) – and when he heard about my six-hour trip yesterday with Kim and Pete, Joost wondered if I could take him today to do the same thing? It just so happened that I was free, and happy to entertain on the ocean instead of stain the cabin – which WAS my plan. Too bad, we were not able to see the numerous Hunpback whales and black bears that we saw yesterday, but Joost and I did see everything else, and the day and scenery was pleasant under sunny skies and calm seas. One cool thing that happened was – at the head of one of the fjords, there is a nice river flowing into the bay, and I had often wondered if there was a natural salmon run there, and, if so, what kind? why doesn’t anyone pay any attention to it? etc. Well – today we were there just after low tide, with the tide starting to come in. I saw fish jumping, fish tailing, and pushing wakes all over up in the bay – so I moved in for a closer look. 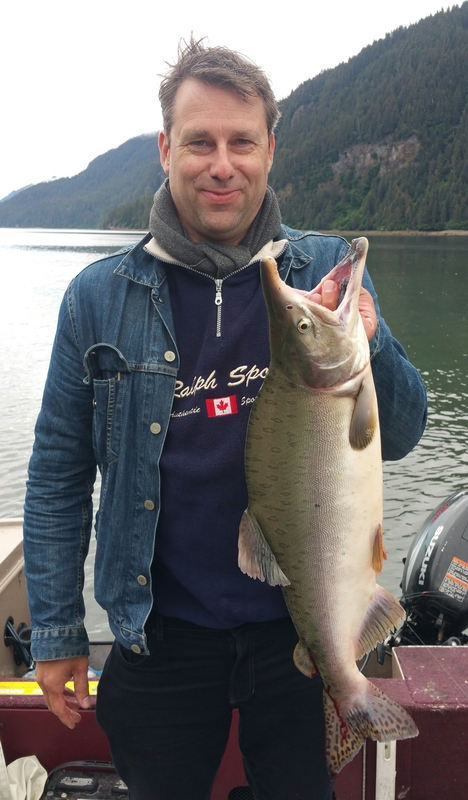 There was a host of Pink and Chum salmon hanging out at the entrance of the river – waiting for the tide to strengthen and fill – so that they could begin their trek up the river. We could see hundreds of them milling about in the shallow, clear water. I stood up quickly, grabbed a fishing pole, and had two fish in two casts – one Chum and one Pink. Joost caught a couple of fish as well – making them the first fish he has ever caught in his life! Apparently, fishing is not that popular in Belgium, nor is there very much opportunity. According to Joost: “there are just a few tiny lakes, and hundreds of people stand around waiting for a bite. It is not so exciting or easy as this!” Who knows… Joost may fish again as he appears to like Alaska, and now has experienced just a taste of what AK has to offer. Joost also explained :”Our fish in Belgium is so disappointing. We go to the grocery store to buy it, but it is always frozen and obviously old.” Joost and I kept a couple of bright Pinks for the grill. I cleaned them immediately when we got home, and combined them with a cucumber/tomato/onion vinegar salad and fresh Alaska potatoes that Maria prepared. Joost LOVED the fresh fish, as did we; we never seem to get tired of the salmon catch of the day – even if it happens a few times a week. Dinner on the deck was perfect tonight – complete with warm sun, and comfort in only shirt sleeves. Even Brody and Blue were spoiled with some fresh salmon scraps and skins. 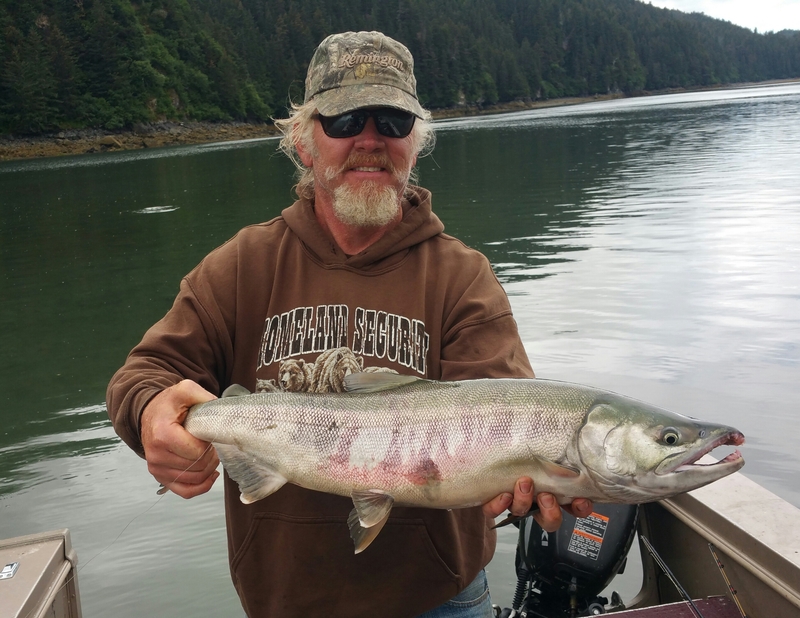 Many guest have caught Salmon this summer with Captain Tim while staying at Majestic View, and many more will throughout the remainder of July, August, and early September. Remember: this could be you at Majestic View. Great story!! Keep showing visitors and guests a good time Tim!! You make me want to go out with you again! !